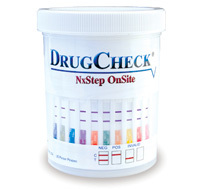 The DrugCheck® Urine Test Cup combines collection and testing into one device for instant results with unrivaled ease, convenience and accuracy. Simply collect urine into the cup, remove the privacy label, and read the results in just 5 minutes. The cup does all the work! Presumptive Positive: One colored line only is visible in each control zone. No colored line whatsoever appears in the appropriate test zone, indicating a presumptive positive result for the corresponding drug of that specific zone. Negative: Two colored lines are visible in the control zone and in the appropriate test zone, indicating that concentration of the drug is below the detection limit of the test or not present.